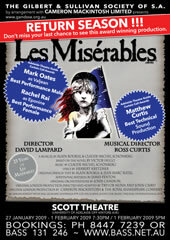 In January 2009 the G&S Society will be restaging its award-winning production of perhaps the greatest musical ever written, Claude-Michel Schöenberg and Alain Boublil’s multi-award winning worldwide mega-musical Les Misérables. Based on Victor Hugo’s book by the same name, Les Misérables has been produced in 38 countries and translated into 22 languages. It is currently the longest running musical on both the West End and Broadway. Les Miserables follows the life of Jean Valjean who, after being released from 19 years of unjust imprisonment, meets only mistrust and contempt whilst shackled to the stigma of being an ex-convict. Breaking his parole, he creates a new identity for himself and flees from his old life. He is pursued obsessively by the police inspector Javert who, believing people cannot change for the better, is determined to bring him to ‘justice’. Les Misérables is an expansive and emotionally complex journey that explores a multitude of themes and ideas, from forgiveness and self-sacrifice, to courage and hope, and ultimately, grace. Les Misérables is a rare music theatre delight – a phenomenally popular musical that never ages and always brings new fascination and awareness every time it is experienced.